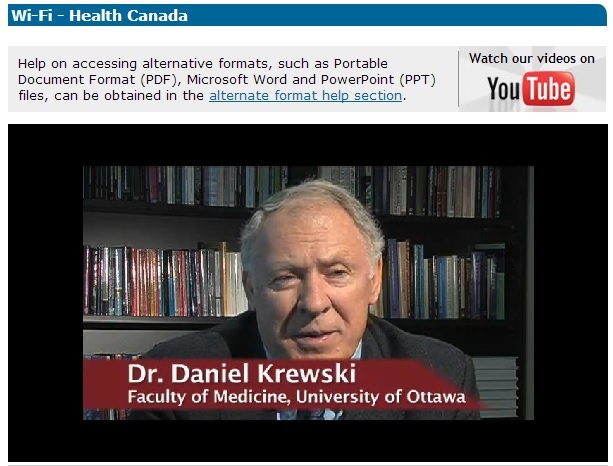 Dr Krewski -Spokesperson on the “safety" of WiFi in this Health Canada video. His voice echoes the stance of the wireless industry. Dan Krewski is the Head of McLaughlin Centre for Population Health Risk Assessment, previously known as Wireless Information Resource Centre (WIRC). Canadian Wireless Telecommunications Association's former President Poirier still manages McLaughlin Centre's projects. CBC Marketplace exposed that the wireless industry, CWTA, funds both the research and salary of Dr. Krewski who promotes that WiFi is “safe”. Dr. Krewski represented Canada in the Interphone Study. Out of 13 countries, Dr. Krewski's Canadian team is the only research group which accepted direct funding ($1 million) from the wireless industry. There are lies after lies behind cellphone and wireless radiation which the mainstream media rarely reports. As in the tobacco industry, one major reason for a lack of definitive scientific opinion is that industry-funded studies have mostly reported no health effects, but non-industry-funded studies have mostly (up to 9 times as often) reported adverse biological effects from EMF exposure. Even a prominent agency such as UK's HPA ignored the conflict of interest and let somebody like Prof. Swerdlow chair their review panel. Even though Prof. Swerdlow and his wife are shareholders of multi telecom companies, he was given the chance to "defend" the "safety" of this technology and then label the report "independent". This is simply unacceptable. The Health Protection Agency's independent advisory group on non-ionising radiation (AGNIR) is an "important" institute to watch for signs of rising cancer cases, including monitoring national brain tumour trends. Recently, this group published a report "Health Effects from Radiofrequency Electromagnetic Fields". "There are still limitations to the published research that preclude a definitive judgement, but the evidence overall has not demonstrated any adverse effects on human health from exposure to radiofrequency fields below internationally accepted guideline levels," said Professor Anthony Swerdlow, chairman of the AGNIR and an epidemiologist at the Institute of Cancer Research." This same paper attempted to downplay the IARC RF classification. Investigative journalist, Mona Nilsson, discovered that Professor Swerdlow is a shareholder of telecom companies Cable and Wireless Worldwide and Cable and Wireless Communications. His wife is a shareholder of BT group, a global telecommunications services company. This conflict of interest was not disclosed in the report. Unbelievable that Mr. Swerdlow, with himself and his spouse being shareholders of telecom companies, are still permitted to chair this panel to defend the "safety" of wireless technology, then label the panel and the report "independent"! "In Canada , for example, most of the national funding agencies explicitly encourage collaborations with industry. Even the Canadian Institutes of Health Research (CIHR), the primary public funding agency for biomedical work, has embraced this trend. In fact, the federal legislation that created the CIHR has declared “commercialization of health research” and “economic development through health research” to be central goals of the agency... As a result, many of the relevant players are acting as expected and as market forces would dictate." "Evidence demonstrates that academic biotechnology research has become increasingly commercial in the last twenty years in Canada and in the US . This obvious realization does not only carry negative implications. Private funds have helped American universities remain on the cutting edge of scientific research and provide the best learning environment for their students. However, it would seem that this increasing emphasis on research commercialization has also created situations where university teachers and researchers could now find themselves in conflict between their traditional academic duties and the new commercial imperatives. This situation is especially worrisome in that it could lead researchers to delay the communication of important findings over substantial periods of time in order to protect commercial interests. 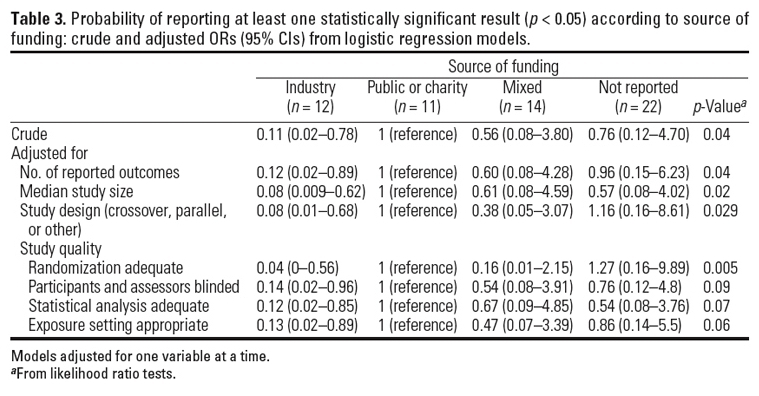 In our article, we first demonstrated the existence of a significant correlation between commercialization and withholding of information in the biotechnology research field in Canada and in the US . We then set out to find where and how, in the commercialization chain, the free dissemination of information was put in jeopardy. We conclude that policy changes may be required to improve the free flow of information." The Effects of Mobile Phones Electromagnetic Fields on Brain Electrical Activity: A Critical Analysis of the Literature. Methods of AbuseHow Do They Game the System? After pork producers contacted his supervisors, a USDA microbiologist was prevented from publishing research showing that emissions from industrial hog farms contained antibiotic-resistant bacteria. A few weeks before a CDC advisory panel met to discuss revising federal lead standards, two scientists with ties to the lead industry were added to the panel. The committee voted against tightening the standards. Apart from industry funding, some scientists have pointed out that the reason for "inconclusive" results could be the difference in genetics of the test subjects, from study to study. Just like in the general population, not everyone who smokes gets lung cancer. As a result, one study on chicken might yield slightly different results compared to another study of the same substance, but on another batch of chicken. However, the difference in outcome should not NEGATE the fact that the substance has caused harm on the first batch, especially where it concerns a substance that is mandated for all. * This article contains information related to Lorne Trottier. Mr. Trottier has contacted us to clarify an error published on the McGill website which has caused some portion of the content of the article to be incorrect. We have inserted Mr. Trottier's comments below for readers' information. Mr. Don Maisch has removed this article (by anonymous author) posted on his website. Federal decision makers need access to the best available science in order to craft policies that protect our health, safety, and environment. Unfortunately, censorship of scientists and the manipulation, distortion, and suppression of scientific information have threatened federal science in recent years. This problem has sparked much debate, but few have identified the key driver of political interference in federal science: the inappropriate influence of companies with a financial stake in the outcome. A new UCS report, Heads They Win, Tails We Lose, shows how corporations influence the use of science in federal decision making to serve their own interests. 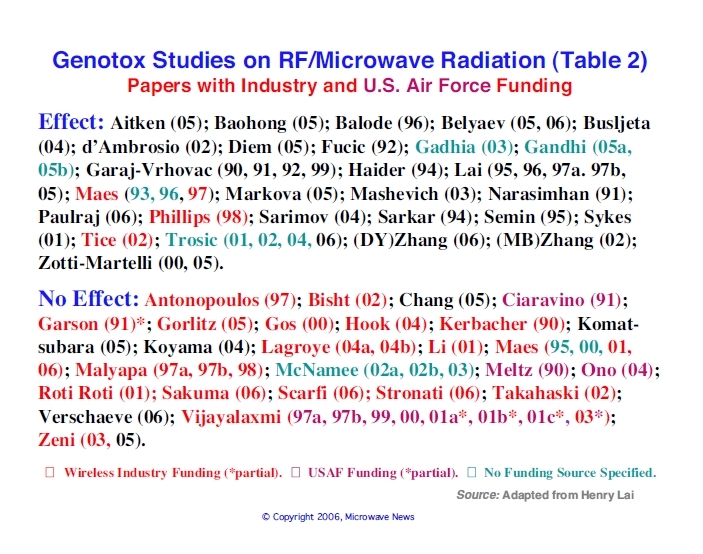 Following the World Health Organization’s classification of Radiofrequency Electromagnetic Fields (RF-EMF) as 2B Possible Carcinogen to Humans in 2011, this year the American Academy of Environmental Medicine, the Swiss Physicians’ MfE, the Austrian Medical Association and the French Health Research Group led by a Nobel Prize-winning scientist have all issued public statements calling for precaution against wireless radiation and proper treatment of electrohypersensitive (EHS) patients. In Quebec, however, things go backwards. Electronics tycoon Lorne Trottier has financed an “urban-electro Brigade” operation to publicly deny the hazards of EMF and the validity of Electrohypersensitivity. Lorne (owner of Matrox) enlisted 60 academics, mostly from McGill University and École Polytechnique de Montréal to which he has donated tens of millions of dollars. Lorne Trottier is a zealous critic of all the science that point to negative health effects of electromagnetic radiation. He has written numerous articles attacking scientists and scientific studies that do not support the “safety” of EMF/EMR which he promotes. His pro-EMF opinion is disseminated through his own website EMFandHealth.com, a host of “skeptic” websites which he is connected to. Even Amazon.com! The article on your web site also claims that I have made substantial investments in the wireless industry through my alleged association with iNova Capital. For your information I have never been a shareholder or administrator with this company. In fact I have no association whatsoever with iNova Capital. The only potential link, which is not really a link, is that I am a representative of McGill University on the Board of MSBiV, of which iNovia Capital is a shareholder. The role of MSBiV is to help professors at McGill to commercialize their research, the majority of which is in the medical area. I serve on the board of MSBiV on a pro bono basis and I have no financial interest in either iNovia Capital or MSBiV, nor any of the companies or startups they are associated with. The web site https://secureweb.mcgill.ca/boardofgovernors/other/non-board, had contained erroneous information that I was an administrator at iNovia Capital. This error has been corrected. In short, the claim that I have invested millions of dollars in wireless technology is simply false. The article on your web site also contains false allegations concerning my association with the Centre for Inquiry Canada. In the article I am accused of making a financial donation to this organization in exchange for the employment of my nephew Justin Trottier. I have been a donor to CFI for several years and I plan to continue doing so, whether my nephew continues to work there or not. "